My computer travails continue, but my laptop’s working for the time being, long enough for me to complete a draft inspired by this week’s ReadWritePoem prompt — an evocative photograph. Per my usual tendencies, I’ve taken their nudge in my own direction. This might be altogether too abstract or wordy or [insert negative adjective here], so feel free to speak up with any thoughts yea or nay — I can take it! Having finished the letters of Robert Lowell and Elizabeth Bishop, I feel greatly affectionate towards them both. I can imagine how the plotline would get sexed up, but I’m stating here for the record that I think a future biopic should without question cast Robert Downey, Jr. as RL, and for EB, perhaps Meryl Streep: I think she’s more petite than her outsized talent makes her seem, and, well, Meryl Streep = Awesome. Someone should definitely get to work on this. I’ve begun on the poems now. What a striking contrast it is to hold RL’s Collected Poems in one hand, and EB’s Complete Poems in the other! As a result, yes, I do think RL’s output is more uneven, but I’m still finding much I love, particularly his book of sonnets, For Lizzie & Harriet (1973). Maybe I can appreciate them more now because of my own growing family, but his poems from the stance of fatherhood really move me. Yes, reading the letters first was putting the cart before the horse, but it’s reading the letters that gave me a new appreciation for RL & EB as poets, strange as that may sound, and compelled me to go back to the poems. Because there’s a lot of poem-talk between them, with drafts going back & forth. Real discussion ensued RL’s troubling inclusion of Elizabeth Hardwick’s letters in some poems, and my thoughts about this action, which always seemed patently mean, has evolved. Not that it would be, or is, any of my business, generally, but this was/is an issue of ethics in poetry (as EB said in a letter, “…art just isn’t worth that much.”). Reading Words in Air, I could see how RL grappled with his choices, as a poet/husband/father, how his decisions vis-à-vis Elizabeth H.’s letters becoming grist for his poetic mill were not made lightly or in spite. And that changes a lot for me, as a reader. He did what he thought the poems required, but not coldly or without heartfelt debate. I know it should be all about the poems, and when I read a poem, I do try to leave biography out of it. However, intentions matter. If a poet holds certain prejudicial beliefs, I might be able appreciate his/her work, but I’d never admire it in a meaningful way. I’d never be able to carry such a poet’s poems in my heart. Draft of the Week, #12. Wild January thaw — this weekend it’s supposed to warm to the 50’s, and give us a deluge of rain — by Sunday evening we probably won’t have any snow left on the ground! Naturally, Lance was planning to take Vincent to a breakfast for the local snowmobile club on Sunday morning. The breakfast is still on, but probably no snowmobiling will be on evidence. Poor Vincent. Massachusetts’ special elections to replace the irreplaceable Ted Kennedy this week kept us busily angst-ridden. Despite the wreckage of his youth, I always felt secure with Teddy as my senator; now I’m unmoored, unsure of our direction. This week’s poem reflects that uncertainty, I would wager. It’s in the form of a madrigal, which is defined as a lyric consisting of one to four strophes of three lines followed by a two-line strophe called a ritornello. Strictly speaking I think it’s supposed to be a love or pastoral poem — I think I’ve captured a bit of the pastoral. We’ve been working on the Collected Poets Series website, revamping it, expanding it, and this week we added some footage of Nancy Pearson’s reading two weeks ago. Our ultimate intention is to create a video archive of the CPS events so that everyone, regardless of geography, can enjoy them. This is our modest first step. Modest in length, and Nancy’s quiet delivery — in content, not at all! So please, check it out, and tell us what you think! The poet Carmine Starnino contributed a trenchant & tremendously fun prose piece, “Lazy Bastardism: A Notebook,” to this month’s issue of Poetry. I really enjoyed reading this — it’s so full of tasty bits I couldn’t help interrupting my husband’s reading to quote several passages to him. And at several passages, I was restraining myself. If grown-ups don’t read poetry, it’s not because they have a bone to pick with poets. The truth is even more intolerable: they prefer not to. How often do we need to be Bartlebyed before we finally admit to ourselves that those Clancy-thumbing dentists and Grisham-toting lawyers aren’t confused or afraid of commitment? They’re just not that into us. I’m deeply interested now in reading more of Starnino’s work, prose and especially poems. He’s Canadian, so I’m unsure of how available he is in the States, and besides which I’m still in a book-buying freeze. Thank the poetry gods for the internet! Andrea Cohen has two poems in this issue, also, and they fairly fizz with word play — they also required the full read-’em-outloud-to-the-husband treatment. Poetry‘s January podcast features her reading one of them, and, among other things, a conversation with…Carmine Starnino! Yes, I like him very much. What does he mean by “lazy bastardism”? I’m afraid you’ll have to read his notebook to find out, because I couldn’t even begin to do it justice. Brief PSA: WEAVE 03 is here. I’m taking advantage of Aidan’s nap & Lance’s bringing Vincent to the fuel assistance office to get a start on a new poem, but I took a break to open my mail, making an extension of my break necessary: my contributor’s copy (& subscriber’s copy) of Weave Magazine arrived today, and it is simply stunning. I am thrilled to be included in the new issue among a bevy of great work, the vibrant cover art not the least of it! You can see the stellar list of contributors on Weave’s website, and order your own copy while you’re there, or better yet, for a mere $14, subscribe! 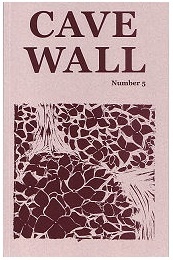 And while I’m banging the drum in support of poetry journals (again), don’t forget Cave Wall. Editor Rhett Iseman Trull (whose own prize-winning book of poems, The Real Warnings, was just released this fall) continues to put out a fresh & remarkable journal twice a year. Go to Cave Wall’s website to check out the contents of its latest issue, and tell me you’re not impressed. And truly, subscribing to poetry journals is so cheap! Coming from me, that’s saying something. Best of all is that frisson of excitement when those little poetry packages arrive in your mailbox! If you love a journal, support it. This is not a test. Collected Poets Series, Jan. 2010. Thursday, January 7, 2010, at 7:00 pm, poets Nancy Pearson and Afaa Michael Weaver will help the Collected Poets Series welcome the new year in a special benefit for the Green River House. *Please note the time change. The Green River House is a community-based rehabilitation and support program, provided through Clinical and Support Options (CSO), for mentally ill adults. CSO’s mission is to provide responsive and effective interventions and services to support individuals adults, children and families in their quest for stability, growth and an enhanced quality of life. For more information about the poets and to check out our schedule of upcoming events, please visit our website. Please come out if you can & show your support for this important program! Re: Draft of the Week, #11. I’ve read various poems by both Elizabeth Bishop and Robert Lowell, and I have a copy of Lowell’s Complete Prose that, although I haven’t finished it, I’ve read a fair amount of. (I got it for $1 in 2008, what a steal!) But somehow I never realized what true friends they were to each other until last year, when I read all the brouhaha that accompanied the publication of Words in Air: The Complete Correspondence Between Elizabeth Bishop and Robert Lowell. I’ve at last made up my mind to attempt something very difficult. You said “Let me know things you question,” and I’m going to and I pray you will please not be proud and sensitive. I am very much worried by the French translations, particularly the Rimbaud ones. Your English, your force and meter, are very over-riding and of course the meter of the Racine is a tour de force, I think….But once in a while I think you have made changes that sound like mistakes, and are open to misinterpretation. … I don’t want to sound scared, over-cautious, afraid of criticism, but I do want you to keep your reputation for solid, severe, painstaking workmanship. Your star is so very high right now. Bishop is so manifestly worried for her friend, she writes two letters in this vein, detailing her concerns. I found it very moving, the care with which she clearly chose her words, how much she seemed to agonize over it all. I’m about halfway done, and absolutely need to read much more: I requested a biography of Bishop, and of course the poems of each, from the library, with Lowell’s biography next on the list. Does anyone have a recommendation for a good one? It looks like the two to choose from are the Paul Mariani and the Ian Hamilton, and I’m leaning towards the Hamilton at the moment. It would be lovely to begin the New Year with a brand new draft, but the poem I’m working on right now is, wonder of wonders, a bit long, for me, a poem in four parts, and not yet finished. I could post part one, but the sections really are integral to each other, so I’ve decided that you’ll have to take my word for it: I am indeed writing & being ever so industrious. Thanks for visiting me here and keeping me honest. Thank you for reading, whether you comment or not, and thanks to the legion of other writers in the blogosphere who have immeasurably enriched my life through their posts and friendship. Here’s to another poetry-filled year!